Civil servants are under more pressure than ever before, and stresses and strains at home can make thing worse. Jo Clift urges managers to pay attention to their own mental health – and that of their teams. Things fall apart; the centre cannot hold”. Many readers will be familiar with this line from W B Yeats’s poem Second Coming, which hints at possible anarchy followed by seismic change in the world. In this era of Donald Trump, tension with North Korea and uncertainty over what a post-Brexit UK will be like, it can feel as though things really are falling apart. From a Whitehall perspective, there are few signs of an end to austerity, and the political situation is unstable. So how are our public institutions faring and – more importantly – how are our public servants holding up under the strain? Frontline public services in the UK are creaking under the strain of increasing demand and fewer resources – a situation archly depicted by the ‘More of Less’ strategy imposed on hapless managers in the BBC mockumentary W1A. There are daily media reports of prison staff, police officers, firefighters and paramedics finding that they cannot cope with the pressures and expectations of the job. It is easy to see why a doctor or nurse might be suffering from work-related stress, and it is surely a sign of progress that firefighters and NHS staff feel they can talk about the difficulties they face – but what about the people who work directly for the government? My observation is that Whitehall civil servants are under increasing strain – partly because of the challenges of the job, but also because many civil servants find it hard to be open about the pressures they are experiencing, especially if those pressures originate at home. My professional life was interrupted by an injury followed by illness, and part of the stress of the situation came from the responsibility I felt to return to work as soon as possible. One evening on the train home from work I had found myself texting a work colleague with blood-stained fingers. The text read: ‘I don’t think I will be able to make the meeting with the SpAd tomorrow… will keep you posted’. The blood was from a head injury I had just sustained; I was still shaking and feeling faint from being knocked over by a cyclist whilst crossing the road near St Paul’s, but had somehow managed to get myself via taxi to Liverpool Street station. Once I reached Walthamstow, my husband took me to A&E, where the staff were shocked that I had been using public transport in my condition. I didn’t make the meeting the following day; in fact, it was a year before I was fully recovered and back at work full-time. I was suffering from post-concussion syndrome, which causes debilitating fatigue and a lack of mental energy. After four months, I started working a few hours a week, and built up my hours gradually. I found my own journey back to health and work tough because I sometimes felt I had lost my confidence. The experience made me more aware of how closely our emotional wellbeing at work and at home are intertwined. As I shared my story with others, I started to see how many colleagues were balancing difficult challenges at home and at work. Of course, this is not news for any parent. But just within my own team I had people who were caring for parents with long-term illnesses, parents of children with special needs, people who had been bereaved, and colleagues going through difficult divorces. Many of us like to think of ourselves as resilient, but dealing with continuous pressure at home and at work can be intolerable. Since the EU referendum, many departments have seen a significant increase in workload. I hear Whitehall leaders expressing concern about the enormous strain that they and their teams are under. I know civil service managers who feel close to breaking point because it is impossible to manage the workload within the timescales and expectations set by ministers. A recent survey by MIND found that 15% of public sector workers said their mental health was poor, compared with 9% in the private sector. And in a worrying trend towards presenteeism, Civil Service World has reported that civil servants who were unwell were tending to take holiday rather than sick leave, or just carrying on working regardless. Does the culture in Whitehall allow individuals to get support when they feel they cannot cope? Are managers just paying lip service to the problem when, in reality, most people still feel they need to put on a brave face and show willing, rather than putting their own health first? In the last year, more and more people in the public eye have been willing to be open about their own mental health problems. One of the first within Westminster was the deputy editor of the Spectator, Isabel Hardman, who chose to share her struggle to recover her mental health, rather than hide away. This is all to the good. 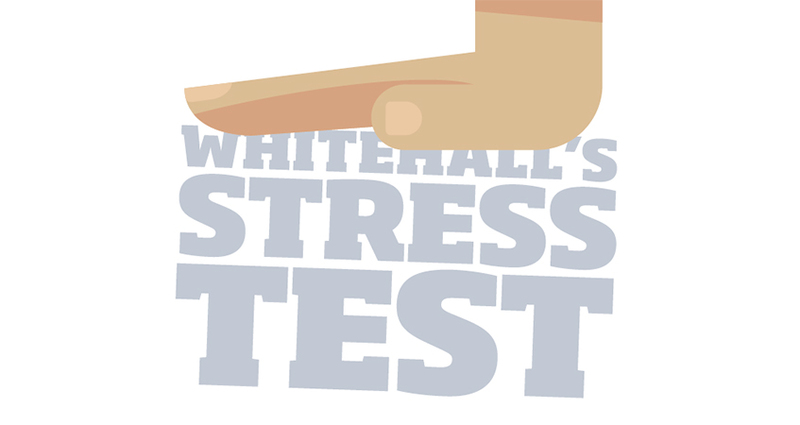 Whitehall leaders from the Cabinet Secretary downwards have been encouraging all civil servants – particularly those in leadership positions – to discuss stress, pressure and mental health issues. Again, this is a welcome development, although it seems to have been prompted by the rather selfish concern that if staff are not supported, they are likely to burn out or leave, making it even harder to deliver Brexit and the other business of government. However, I have also heard from civil servants that they are spending so much time on engagement activities – including ‘wellbeing’ responsibilities – that their ability to do their ‘day job’ is suffering. It is important that the wellbeing agenda does not become yet another pressure that puts civil servants under even more strain. We cannot take our own mental health, or that of our colleagues, for granted. No one would expect us to come to work with a broken back; we would be expected to ‘convalesce’ (a word, incidentally, that seems to be disappearing from our vocabulary). We all know that mental health is the poor relation within NHS, but we are often guilty of treating it as a second-order issue in the office too. How many of your team would feel that they could spontaneously work from home for a day, and be honest that they were doing it for emotional or mental health reasons? How many of your team have taken annual leave when they were feeling unwell, or had a medical appointment they felt they couldn’t be open about? As a manager, are you open with your team about the pressures that you are facing yourself, and are you sharing your strategies for dealing with them? If the answer to any of those questions is ‘no’ or ‘don’t know’, then you may be finding it hard to negotiate the pressures of the office yourself, and you will inevitably struggle to look after others. It may be that this reflects the culture in the wider department that you work in. So to return to Yeats, can the centre hold? Or will things fall apart? It seems to me that the truth lies somewhere in the middle. Government will continue to function, and probably function pretty well. But the question is how much individual civil servants will have suffered in the process. Jo Clift is a former senior civil servant who now works as an independent consultant and trainer in personal resilience.